I don’t know about the weather where you are but here in the southern UK it has been so volatile. It is difficult to plan any sort of photographic endeavours! We have had everything from super cold temperatures to a ton of rain with storm gale force winds. Still, that hasn’t stopped me from working. This year is going from strength to strength, it's amazing what a bit of effort can bring in. One particular job a couple of weeks ago was an all day affair with 3 red, white and blue minis hurtling around Bournemouth. This was part of a promotional video for the local council. Having a councillor with us all day made permissions and grants a cinch for the flying of drones. 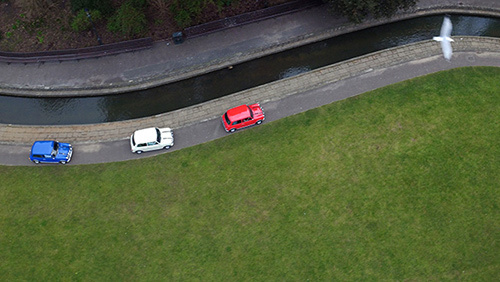 I was asked to provide the aerial footage of this superb day which had the infamous Paul Swift driving one of the minis. Paul (Paul Swift Stunts on Facebook) has appeared in many films and TV shows including a regular on Top Gear. The video is to promote the fantastic Wheels Festival in Bournemouth this June. Worth catching if you are a petrol head, speed freak or adrenaline junkie and happen to be in the south of the UK in June. Like the Wheels Event Facebook page to receive updates and see the video in its entirety soon. This is a new and free firmware update 2.5 for the "still-superb" Panasonic GH4 camera. It brings some new, possibly gimmicky, features to play with. This camera still amazes me with the amount it can do and two years on, it is still a strong seller. Regardless of the impending GH5 rumours, people are still buying this excellent camera. Panasonic are still kindly giving away cool firmware upgrades. This latest offering gives two very cool features that could come in very handy for those wanting perfect images easily and "on the fly"
Canon announced the latest in their line up of flagship cameras last month which is the 1Dx Mark II. This is a stunning camera offering a lot of bang for your buck. I am really excited to see some of the real world results from this beast. Canon have kept the megapixels to a reasonable 20.2. However, they have increased the performance in low light by using gapless micro lenses. Could be a great upgrade for wedding photographers. The 1Dx Mark II can also shoot 4K at 60fps and 1080p at 12pfps. This is fantastic and something I know a lot of videographers have been asking for. However, there are a number of features missing which could put a few people off. It is worth remembering that this is a stills camera first and foremost and as that, it is stunning. Something deep inside me can’t help but feel that the bulk of this camera has seen its day. Today we have incredibly high quality stills and 4K video coming from much smaller, mirrorless cameras such as the Sony A7s II and Sony A7r II. Is it time Canon followed suit and started producing smaller cameras for their flagship models? I know that as I get older, carrying around two huge DSLR’s with large Canon L lenses is taking its toll on my back after a full day. I am waiting this year to see if Canon can blow me away with the EOS 5D Mark IV (if it ever happens). If they don’t, I may well be switching to the Sony mirrorless cameras as well as looking out for the Panasonic GH5. Where For Art Thou Go Pro? Go Pro have now missed their usual upgrade late last year for the Go Pro HD Hero range. I fear for the future of Go Pro and their amazing range of products. For me, the Go Pro Hero 4 Session was a flop and the halving of its price soon after release suggests that Go Pro think the same perhaps? I had been really looking forward to seeing the new HD Hero 5. So much so, I sold three of my old Go Pro’s in anticipation only to be disappointed when nothing materialized. The missing Hero 5 along with the delay of their drone division and the Karma drone leave me wondering what is happening. Go Pro share prices have also reflected my concerns as they continue to plummet. Only a really, really cool Karma drone and HD Hero 5 with everything we dreamed of (8K video, 4K at 120fps, 1080p at 240fps, great low light performance, improved stills quality, no more distorted footage etc) can bring them back I guess. Good luck with that! Now this was an announcement that many people had been waiting for although I have to say it looks pretty bland (and Apple-like) but are its looks deceiving? I am getting more and more into aerial video and photography as time goes on. The sheer number of companies now producing drones is staggering. This is already a multi-billion pound industry and is only going to get bigger. I love most forms of photography and lately I have been doing a lot of real estate photography for large houses with a lot of land and stunning surroundings. Nothing can beat aerial photographs of such places. They are sure to help when selling or promoting properties like this. I can think of no better way to spend my working day than flying my cameras and getting paid for it. DJI are the new Go Pro in my eyes and are taking the world by storm with a number of products. The Phantom 4 is one of those products. It has additional cameras that assist with object avoidance. The Phantom 4 will fly at incredible speeds and capture stunning 4K footage on the fly (as it were). However, is the DJI Phantom 4 enough for Phantom 3 professional owners to upgrade? Is it enough for DJI Inspire 1 pilots like myself to consider buying one? What does it bring to the table (or skies)? Free Nik Software from Google worth $499! Yep, for whatever reason, google have decided to make this amazing software free for all photographers. So, go and grab a copy before they change their mind. If you bought this software in 2016, they are offering a full refund too! Sadly that is all I have time for right now. There is so much going on in the world of photography and video this year I am really looking forward to what it brings. More so than last year. My love affair with DJI (and the Inspire 1/X5 camera set up) is blossoming. Even more so after purchasing the amazing DJI Ronin 3 axis gimbal. I used this incredible piece of kit on an all day job last week and it performed flawlessly when shooting video. It even comes with a controller similar to that of my drone! I will be reviewing this along with the Inspire 1/X5 camera soon I hope so until then, happy shooting, enjoy the impending good weather (I hope) and see you next time!